" We respect a lot the Indian position, because first of all it’s based on the international law, it’s based on the charter of the United Nations, it’s based on the morals of the world, of the human civilizations first, and Indian civilization second, the Indian people’s morals. This is very important, that’s the difference between state and regime: the state bases everything, all its vision, all its policy on the ethics of its own people. So, we respect the Indian position in that regard. Second, as you just mentioned a very important word, it was “independent.” In spite all the pressure, all the Western pressure on every country including India to join the embargo against the Syrian people, India wouldn’t cease its relation with Syria, and some of the investments are still going on in Syria with Indian participation in different sectors because of that independent position." "Definitely, definitely. First of all, if you want to talk about the political part, the most important factor for any player to play any role in such a complicated conflict is to have credibility, and India through the history has always been credible. Through the different parties that took power in India, we never noted that there’s any fluctuation in their policy because it’s based on morals and ethics as I said. So, this credibility is a very important factor for India to play a role, not necessarily within Syria, because the Syrian conflict is not only Syrian; the main factors are regional and international, and the most important part of this that how can we protect international law. So India as a main country on the political arena today has to do its utmost in order to protect the international law and the Charter of the United Nations through its relations. India has relations with every country in this world. So, with their effort, the effort of their officials and the government, they can help in that regard." "Of course, definitely, definitely, and the scope of the relation between Syria and India, I would describe it as ample scope, and that was my plan in 2008, and this relation was moving upward. Because of the war, things have changed in a different way, but of course after this war India will be one of the first countries to visit, not because of the scope of the relation, but actually because we have to be faithful or loyal to every country that was objective and moral in its position toward the war in Syria." From President Assad's Belarus ONT Channel Interview, May 11, 2017. "Of course, they should be similar, because the party planning and implementing these acts is the same. It is the United States as a maestro and the Western states constituting the choir. Latin America in general, and Venezuela in particular, used to be the backyard of the United States for decades. Through that backyard, Western states, particularly North America, or the United States, used to secure their economic interests through the influence of the big companies in your countries. Military or political coups in Latin America during the 1960s and the 1970s aimed at perpetuating American hegemony over the interests of your people. But Latin America freed itself during the past twenty years and gained its independent decision-making. Governments started defending the interests of their peoples, which is unacceptable to the United States. That’s why they are exploiting what’s happening in the world, starting with the orange revolution in Ukraine up to the recent coup there a few years ago, and what is taking place in the Arab countries, in Libya, Syria, Yemen and others, in order to implement it in Latin America. They started in Venezuela with the objective of overthrowing the national government, and it will spread over to other Latin American countries." From President Assad's Venezuelan Telesur TV Interview, April 27, 2017. "Let’s be very clear about their position, which is not to support the Syrian government or the Syrian president, because in the West they try to portray it as a personal problem, and as Russia and China and other countries and Iran support that person as president. It’s not the case. China is a member of the Security Council, and it’s committed to the Charter of the United Nations. In that veto, China has defended first of all the Charter, because the United Nations was created in order to restore stability around the world. Actually, the Western countries, especially the permanent members of the Council as a tool or means in order to change regimes or governments and to implement their agenda, not to restore stability, and actually to create more instability around the world. So the second part is that China restored stability in the world by creating some kind of political balance within the United Nations, of course in cooperation with Russia, which is very important for the whole world. Of course, Syria was the headline, the main headline, this is good for Syria, but again it’s good for the rest of the world. Third, the same countries that wanted to use the UN Charter for their own vested interested are the same countries who interfered or tried to intervene in your country in the late 90s, and they used different headlines, human rights, and so on, and you know that, and if they had the chance, they would change every government in the world, whether big country or small country, just when this government tries to be a little bit independent. So, China protected the Chinese interests, Syrian interests, and the world interests, especially the small countries or the weak countries." From H.E. President Al-Assad’s interview with Cuba’s Prensa Latina. July 21, 2016. "We have natural relations with them, we have natural relations with Argentina, with Venezuela, with Cuba, with all those Latin countries we have normal relations. It hasn’t been affected by the crisis, and they understand more and more, and they support Syria more and more." From President Assad's Interview with Spanish El Pais Newspaper, February 21, 2016. "We recently had Syrian officials visiting China. Actually, the relation with China hasn’t deteriorated, and the communications didn’t stop. We still have embassy, and your ambassador is still active during the crisis, he never left. And the most important thing than these formal, let’s say, accessories, if you want to call it, actually the Chinese positions. China took four vetoes for the Syrian crisis, supporting the government, supporting the Syrian people, and supporting the international law, and let’s say the United Nations Charter. So, yes, the relation is very stable, let’s say, for decades now. Indeed, it wasn’t influenced by the crisis. But the most important thing to the Chinese people, now China is one of the greatest countries in this world, to be a great country doesn’t mean to have a great military and great economy; you need to have great values, and that’s what the Chinese have today. And when you talk about the Chinese government, Chinese politics, it normally reflects the values of the people, it’s not separated. So, the more role you have in the world, the more influence, the more weight, the greater you are as a country, the more responsibility you have towards the rest of the world, all the world. You have to regain the balance of the globe, and you have to support the values and the United Nations Charter. You have to rectify the moral decay of the Western policies that we’ve been paying the price of. So, we look toward what the Chinese people and the Chinese government will do for our world in the future, near future and after." "We have old relations with the former Soviet Union and later with Russia, for more than six decades now. They have never tried to impose anything on us throughout the history of this relation, particularly during this crisis. The dialogue between Russia an America is not about interfering in Syria, the dialogue is happening between two sides: one which believes in interference in other states’ affairs, i.e. America and the West, and the other seeks to prevent such an intervention, prevent hegemony and violation of Security Council’s resolutions and UN Charter, i.e. Russia, the BRICS countries and a large number of other countries. It is not true that this dialogue is about intervention. They are not discussing the nature of the political system in Syria, or the identity of the next president, or how to solve the problem of terrorism in Syria. They are discussing the principle of the independence of the Syrian people’s decisions. That is why I believe that this dialogue is in the interest of Syria and the interest of the peoples of the world. When there is a strong power with allies defending the independence of peoples, this is in the interest of all of us, in the interest of the sovereignty and independence, which we have been so proud of for decades." From H.E. President Al-Assad's Interview with the Iranian Khabar TV, October 4, 2015. "This agreement will open the doors widely before the Syrian-Ukrainian relationship and at the same time will enhance relationship between the two regions. This is why we focused today in the first place on the transport issue, particularly sea and air transport, as it is the basis for developing the relationship,"
"We want to connect the Arab region with Southern and Eastern Europe through Turkey and Bulgaria,"
"Our joint determination to develop economic relations necessitates that we invest the natural advantages we have in terms of our unique position in order to deepen cooperation relations between us through establishing joint economic projects and providing more facilitations to the businessmen in our two countries,"
"Syria's relations with Venezuela consolidate its ties with South America and vice versa,"
"We have concentrated our talks on the bilateral relations… we have signed cooperation agreements in the fields of oil, tourism and the route between Damascus and Caracas… we have talked about the Arab-Latin American Summit that will be held in Peru in the coming February and the necessity of preparing for this summit,"
"Syria shares Venezuela's rejection of any intervention in the internal affairs of our countries and regions as well as the other neighboring and surrounding countries." 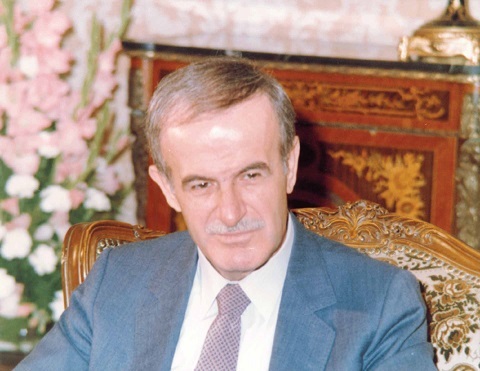 ''The relations between Syria and Belorussia have always been characterized with reciprocal respect and support,"
"If we want to think in an ideal way, we could say that there should be international organizations that sponsor interests among the states and work to find right relations and connect these interests between the countries and peoples, but realistically we don't see this issue is applicable in the near scope." "We have to improve our relations with each other as states, and this is what has been done between Syria and Belarus in our regions. Belarus improves its relations with the neighbouring countries and establishes strong joint interests; and when we consolidate this relation between Syria and Belarus, sure this will be reflected on the relation between the two regions." "We want this tour of Latin America to build relations among independent countries which are Syria, Argentina, Brazil and other countries in the South. We have a true human bridge, and we must consider how to benefit from you as a community to bolster relations between Latin America and Syria." 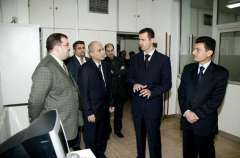 ''Syria seeks to develop cooperation with many countries in the world, whether the distant or near countries…What makes Syria cooperate with a far continent is this independence in the political decision in addition to the just stances adopted by those countries away from any intentions in hegemony or occupation, among them Argentina." "Coordinating Arab-Latin American efforts in the next stage will help find solutions to our problems and causes, depending on objective vision and far away from delusion and fabricated lies. It is just as what happened in Iraq war and as others' attempts to repeat the same scenario regarding many international issues." ''The Syrian-Brazilian relations are historic, dating back to the 19th century when the Syrian immigrants established them. They were loyal to the country which hosted them and interacted with its people without relinquishing the heritage of their nation. The historic relations between the two countries are a motive to develop economic and political relations''. “Syria, Iran, Turkey. But also Russia. These are all countries that are linking themselves to one another, even physically, through gas and oil pipelines, railways, roadways, systems for transporting electricity. One large perimeter links five seas: the Mediterranean, the Caspian Sea, the Black Sea, the Arab Gulf and the Red Sea. We are talking about the center of the world. From South to North and from East to West, any one who wants to move has to cross this region. That is why this region has been plagued by wars for thousands of years”. "These bonds make potentials of cooperation and rapprochement between the two countries- Syria and Armenia- without limits. These potentials must be invested through opening new horizons to reach highest level of economic, trade and cultural cooperation,"
"Syria and Armenia live in an important geopolitical region that big international interests meet and intertwined. This requires that the two countries cooperate and coordinate and agree on details and strategies,"
"Japan has a very vital role in development in Syria. But we would like to see more of a Japanese role in the peace issue." "Iran is a regional neighbor, and if we disagree with it, we should start a dialogue. What Syria is doing is helping this dialogue,"
"The US may take a fool action, if we were to think logically. Such an action is to be harmful for the region and the world. We have to remain ever alert for any reckless action by the US, or by Israel against Iran , Syria, Lebanon, or against any other state….The problem for the world will be far more bigger than that of the Iraqi invasion considering the strategic position of Iran and its power. The situation would be very difficult for the US, its consequences would cover all the world in general. If the war were to begin, how is it to conclude; nobody knows! But we will be the first to pay the price: the Arab countries, especially the Arab Gulf region which is to pay a very high price for such an action…. We are all targeted, no country in the Arab World is not to be the price for the explosion to happen." 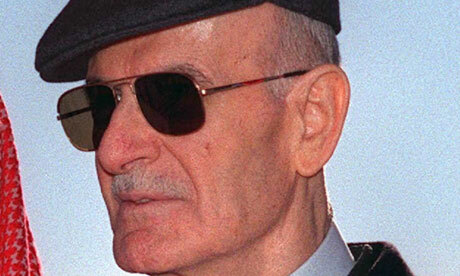 " Iran is an important state in the region and its role is necessary for the region's security, in integration with the Arab role and not as an alternative,"
"I frankly said that some are talking negatively about an Iranian role…The only solution is through creating an effective Arab role, so let us, on the Arab level, move in the Iraqi direction because it poses the main axis for talking about the Iranian role." "Syria's policy also seeks to expand its relations with different countries which are important through its permanent membership at the Security Council…but we also expand our relations with Asian countries in general and with Latin America. These relations are important now under the international conditions in which America unilaterally leads the world." “I do not know what they mean by greater or smaller Mideast. What concerns us is whether any proposals contradict our interests or not. When I criticize a terminology, I do so because it comes from abroad. We are the party in the ME which has to define the terminology. It is our main concern to decide whether we call ourselves a greater, smaller or medium ME. What is important is that the content of the terminology should not contradict with our interests, our normal historic relations and our culture. As an accumulation of history, when culture is encroached upon, negative consequences will destabilize the region. Culture can not be separate from other elements." 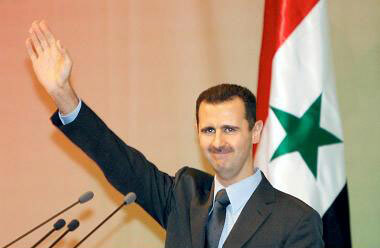 “A couple of days ago there was a statement that the European Union did not invite the Syrian President. Of course we responded in a clear manner. This shows that they do not accept any Arab to decline an invitation. It is incomprehensible for them that anyone might say no, even to an invitation to a conference. " "China is now a superpower and is very important after the absence of the Soviet Union. China’ s role has expanded across the world and has become more important especially for small countries including Syria. China now is a key element in international affairs. It is very important for several pressing issues and for the Middle East region, for the ME peace process, for Iraq and for terrorism combating." "Our relation with Turkey has specific peculiarity. There are many things that link us to Turkey which helped start this relation quickly during the past few years,the most important of which are the joint desire and sincerity of dealing . The cause of Iraq came to make danger direct and same on Syria, Turkey and Iran which caused high level coordination among these states."